Character information for Tidus, the protagonist of Final Fantasy X. Included are his background, stats, skills, and overdrives. Tidus grew up in the metropolis known as Zanarkand. His fondness for Blitzball was largely influenced by his father. This led Tidus to eventually pursue the career as a rising star. 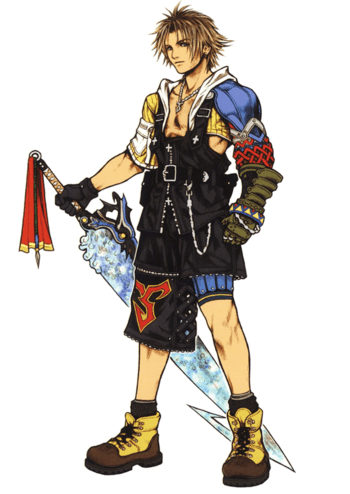 His signature move in Blitzball was named after his father, Jecht, who went missing 10 years prior to the start of the game. To honor his father, Tidus joined the Jecht Memorial Cup, only to find that an unknown creature had invaded the city. Tidus manages to escape from the crumbling stadium and regroupws with his mentor, Auron. His mentor gave him a longsword, passed down from Tidus’ father. Together, they confronted the monster known as “Sin.” Tidus left his hometown and was taken to Spira. He later became one of the guardians of the summoner Yuna. Tidus makes use of both regular swords and shields during combat. He acts similarly to warriors and fulfills the duty of protecting the summoner. He and a few others are able to fight underwater.